LPs are precious: Not only for their excellent sound quality but in many cases as irreplaceable collectors items. Even when great care is taken, over time it becomes inevitable that they become dirty. Careful cleaning of discs is particularly important to preserve their value. Audiodesksysteme have developed a professional yet user-friendly LP-cleaning ing machine which works fully automatically and is very easy to use. The disc is inserted into the machines opening vertically from above and the red button is pressed. The gentle cleaning process runs fully automatically during which time the yellow LED lights up. When, after a short period of time, the green LED lights up the cleaned disc can be removed from the apparatus. Counter-rotating micro-fibre cleaning barrels and ultrasonic waves softly remove even deep-sitting dirt particles from the grooves of the LP. When in operation the machine permanently filters the cleaning fluid. Two extremely high-performance motors guarantee effective yet quiet drying of the LP. For the last 15 years, record-cleaning machines have been limited largely to vacuuming devices. But now there is an innovative, convenient, effective, and expensive alternative -- the Audio Desk Vinyl Cleaner. Record cleaning has evolved greatly since the days when all anyone did was blow off the dust. Next came washing records at the edge of the kitchen sink or perhaps the Diskwasher brush and cleaning liquid. I think, however, that "real" record cleaning sprang from the vacuum machines of Nitty Gritty and VPI. These were followed by the small vortex, string supported, vacuum machines of Loricraft, which came after the early and cantankerous Keith Monks machine in the 1970s. Of course, the Keith Monks machine is now once again available. Description. The Audio Desk Vinyl Cleaner represents a sharp departure from the labor-intensive vacuum idea. For one, there is no vacuum on this machine. Moreover, it is also virtually automatic. 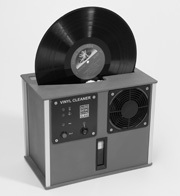 As their information says: Audio Desk Systeme's Vinyl Cleaner is the first and only LP cleaning machine that incorporates an ultrasonic cleaning cycle in addition to a more conventional mechanical cleaning via bi-directional rotating microfiber cleaning drums, and the result is the cleanest LPs ever. Ultrasonic is sound generated above the human audible level. A physical effect called "cavitation" results from the generation of ultrasonic frequencies in a liquid. In this cavitation process an ultrasonic transducer creates ultrasonic "compression waves." When the amplitude of this soundwave increases to a level where the surface tension of the liquid is broken, the fluid will "tear" apart leaving behind millions of microscopic vacuum bubbles. These vacuum bubbles then rapidly compress or implode creating millions of tiny liquid jets small enough to clean inside the smallest grooves of an LP. This process, also called "microagitation," displaces any contaminants on the surface of the LP. And it is fully automatic -- just put the LP in the slot, push the button, and come back in five minutes for a thoroughly cleaned and dried LP (both sides). The basic operation of the unit is simple. You insert the record into a long narrow slot in the top between two sets of microfiber brushes and two white plastic lips on the right side. The instructions say to then slightly rotate the record counter clockwise to get the lips facing upward against the record surface. The cleaning brushes move to embrace the record to assess its thickness and then retract for a brief moment. Counter rotation then moves the lips up and the record remains engaged. I did not find this counter rotation to work well as the wheels that drive the record counter clockwise did not properly engage it. A kind gentleman on an audio forum suggested doing this counter clockwise rotation after the start button was pressed and as the tank was filling with water from the reservoir below. Nevertheless, about five minutes after hitting start, you can return to find a cleaned record ready to pIay. If you are there immediately after it alerts you that it is done, you may find some drops on the record, particularly at the bottom. Also you have to be careful in removing the record to avoid the cleaning brushes or they will wet the surface. However, you see no evidence of deposits left in the fan-drying process. This is no doubt to the benefit of the cleaning fluid as well as the continual filtering done by the unit. This cleaner is a sturdy metal unit measuring 12" wide by 7.8" deep by 10.6" tall. It weighs just over 12 pounds without the just over one gallon of water and cleaner used in the cleaning. The cleaning fluid is unique. In order to treat the vinyl as gently as possible, and create the best possible sound, the cleaning fluid, specifically developed for the Vinyl Cleaner, avoids the use of alcohol, instead relying on a mild biodegradable mixture with excellent cleaning properties and outstanding antistatic characteristics. Just one container of cleaning fluid concentrate. - two are included in the delivery package -- is enough to clean approximately 100-200 discs (depending on the level of disc contamination). Setup. A convenient bathroom sufficed for setting up this cleaner. One would not want it in your listening room, especially during the drying cycle because it is noisy. Also as the fluid needs to be drained after each 100 records cleaned, the availability of a sink is quite useful. I should note that I presently own a VPI 16.5 with the Walker Delrin nozzle and use Walkers Prelude four-step cleaning system. It typically takes me just under ten minutes of attention to what I am doing to clean both sides of a record. The Walker displaced my Loricraft for two reasons. One, records cleaned with the Walker/VPI system after having been first cleaned with the Loricraft unit also using Prelude, sounded better. Two, the Loricraft unit using Prelude took me over 20 minutes per record. Listening. Once I had the Audio Desk Vinyl Cleaner loaded with 4.5 liters of distilled water and the bottle of cleaner, I chose a record that I had just played the night before -- Duke Ellington and Ray Browns This Ones For Blanton (AcousTech/Pablo 2310-721), a double-record 45rpm pressing. This record had been previously cleaned on both the Loricraft and VPI/Walker setups. I was quite attentive to the cleaning on the Audio Desk this first time, although it functioned flawlessly. When finished I immediately put it on my Shindo Labs turntable and played it again. What I heard was clearly more extended on the top end and very involving in that the soundstage was wider and deeper than before this cleaning. I listened through the whole of the first side because I was so engrossed in the music. Ray Browns bass was realistic and his presence was vivid in my room. The Ellington piano was less recessed than it had been in the previous listening. The level of detail, such as Browns fingerings, lent great realism to the music. My next cleaned record was Ella Fitzgeralds Clap Hands, Here Comes Charlie! (Verve VG-4053). This record has always been a problem on the lead-in grooves. There are many pops and clicks that have resisted many efforts to remove. No, the Audio Desk did not remove them, or at least all of them, but it did have the above noted impact on soundstage as well as adding top-end extension. Again, I had a hard time moving on and listened to both sides of the record delaying my getting to bed that night. The next day I decided to clean Ella Fitzgeralds Ella Fitzgerald Sings the George and Ira Gershwin Song Book (Verve 314 539 759-2). I had recently acquired this multiple-record release and had not yet cleaned it. I listened to the first record uncleaned, then I cleaned it on the Audio Desk and immediately relistened. The noise level went down greatly and again the top end became more extended as though the stylus was better tracking the grooves. Perhaps because of this, the soundstage was more realistic. I then cleaned Harry Belafontes Belafonte Returns to Carnegie Hall (RCA lSO-6007), again, a Classic reissue. I have used this album repeatedly because it is live, there is an expansive left-to-right soundstage, the audience is noisy, and the city outside the hall is quite audible, including the subway, which often approaches, stops briefly, and then goes on its way. All of this was more evident when this previously VPI 16.5-cleaned album was recleaned with the Audio Desk. The performance became more engaging, sounding like one was on stage or perhaps just behind it, and when the audience applauded, they sounded as though they were in front of you. This apparent extension on the top end, great realism in the soundstage, and reduction in the noise level was evident in all of the many albums I cleaned. Also, when there was profound bass energy in an album, it was cleaner and deeper than before. I should say something about one last record, Dave Brubecks Time Out (Columbia CS 8192). "Blue Rondo A La Turk" and "Strange Meadow Lark," were just awesome. On these recordings, Brubecks piano has always seemed poorly captured and off to the right, and as much as I enjoyed the music, I could not hear a well-defined soundstage. This was true on several vinyl releases of this album that I own. Not after this Audio Desk cleaning, however. I was transfixed and enjoyed the piano for the first time and heard a soundstage that I could really grasp. Conclusion. I will sorely miss the convenience of the Audio Desk Systeme Vinyl Cleaner, as the VPI with the Walker Prelude that I own takes about four times as long and you have to be constantly present while cleaning a record. The Audio Desk Vinyl Cleaner is very convenient and effective. I would certainly recommend it to anyone. Risk-free tuning in one minute.